Mangoes are widely used in cuisine. 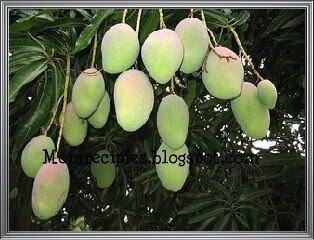 Raw mangoes are used in chutneys, pickles, side dishes, or may be eaten raw with salt or chili. 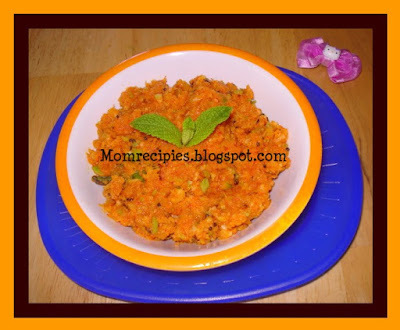 Today I am going to share with you one such mouthwatering, spicy chutney called mamidikaya pachadi or mango chutney. This spicy, tangy chutney tastes heavenly. This is my whole family's Favorite Chutney. 1) Heat oil in a small pan. Add urad dal and mustard seeds. 2) When the urad dal turns a little red, add 1/2 tsp mustard seeds . Fry for a minute and turn off the stove. Let it cool. 3) Mean while, peel the green mango and cut into small pieces . 4) Grind the mango pieces , urad dal mixture ,Red chilli powder and salt into a coarse paste in a blender /mixie. Water is never added while grinding chutneys. 5) If your grinder / blender does not cooperate at all then use a small quantity of water to grind. Transfer the chutney to a bowl and serve. Left over chutney needs to be refrigerated. 6) Heat oil in a small pan. Add the mustard seeds,Cumin seeds and let them splutter. Add the curry leaves and and toss them till the flavors come out. 7) Turn off heat and add the asafoetida /Hing and pour immediately to the grounded mango pachadi and mix well. 8) Serve it with hot steamed rice and a spoon of ghee.You can also serve it with Chapati and Dosas. Mango chutney looks wonderful and tasty.My 1st visit here.Following your blog.Do drop by simplyfood some time.